and likes to eat the daily mail. to hide by covering his eyes. He thinks that black is really white. He’s sure the sun comes out at night. and when it’s hot he starts to freeze. He’s happy when he’s feeling ill. He likes to dance by standing still. he puts bananas on his head. is very, very, very tiny. Writing alliteration poems is a terrific creativity exercise. Not only is it an easy way to write a poem, it’s a great way to get your brains working. You’ll need to think of a lot of alliterative words, and then form them into rhyming sentences. I’m happy to say that today is the day. I woke up delighted and ready to go. My mind is abuzz and my eyes are aglow. There’s no doubt about it. It’s perfectly clear. The time is upon us. The moment is here. and when it begins I’ll be playing my part. I’ll jump in the bustle and I’ll give it my all. I’m certain that soon I’ll be having a ball. But where should I go now, and what should I do? I’m hoping that someone will give me a clue. is yesterday’s gone, so today is the day. The teachers jumped out of the windows. The principal ran for the door. The nurse and librarian bolted. They’re not coming back anymore. escaped out the door of the gym. and ran out the door after him. as staff members scurried and raced. We’d never seen anything like it. to leave on the last day of school. Copyright © 2007 Kenn Nesbitt. All Rights Reserved. From the book Revenge of the Lunch Ladies. Here are some of the poetry writing lessons for children that I have created. These should help you learn to write your own poems. A poetic “form” is a set of rules for writing a certain type of poem. These rules can include the number of lines or syllables the poem should have, the placement of rhymes, and so on. Here are lessons for writing several common poetic forms. There are many different styles of poems. 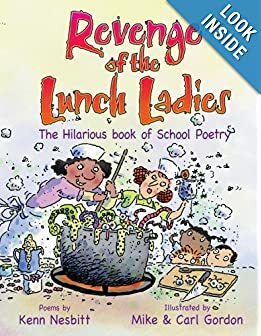 These are not “poetic forms” because they don’t usually have firm rules about length, syllable counts, etc., but they are common enough that many well-known children’s poets have written poems like these. When reading these lessons, you may come across some unfamiliar words. If you see a poetic term and don’t know what it means, you can always look it up in the Poetic Terms Dictionary. Poetry4kids also has a rhyming dictionary and a list of rhyming words you can use to help you write poems. Tanka, which means “short song,” has been an important literary form in Japanese culture for nearly a thousand years. The original Japanese form of tanka had only one line of poetry containing 31 speech sounds—what we would call syllables. However, most tanka poems that are written in English today are broken into five poetic lines with a certain number of syllables in each line. What is a Concrete Poem? Concrete poetry—sometimes also called ‘shape poetry’—is poetry whose visual appearance matches the topic of the poem. The words form shapes which illustrate the poem’s subject as a picture, as well as through their literal meaning. This type of poetry has been used for thousands of years, since the ancient Greeks began to enhance the meanings of their poetry by arranging their characters in visually pleasing ways back in the 3rd and 2nd Centuries BC. A famous example is “The Mouse’s Tale” from Lewis Carroll’s Alice’s Adventures in Wonderland. The shape of the poem is a pun on the word tale/tail, as the words follow a long wiggling line getting smaller and smaller and ending in a point. The name “Concrete Poetry,” however, is from the 1950’s, when a group of Brazilian poets called the Noigandres held an international exhibition of their work, and then developed a “manifesto” to define the style.